The Syncfusion Big Data Platform is the first and only complete development environment for big data available on Windows. Easily develop and deploy big data solutions. 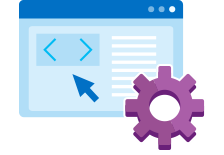 Founded by industry experts in 2001, Syncfusion, Inc. provides the broadest range of enterprise-class software components and tools for the Microsoft .NET platform. The Syncfusion Big Data Platform is the first and only complete development and deployment environment for big data available for Windows. Easily develop and deploy big data solutions. Get started in 15 minutes or less. The Syncfusion Big Data Platform includes a complete production environment that can run Hadoop jobs in a scalable manner on a full cluster. The included Cluster Manager application makes provisioning easy, allowing you to manage and monitor multiple-node Hadoop clusters on Windows. When creating a cluster, manual configuration is not required. The cluster configuration and management system we provide takes care of everything. All you need on each node is a small agent that depends on .NET Framework 4.5 or later. There are absolutely no other dependencies. The cluster manager will then coordinate the complete installation process with the agent. 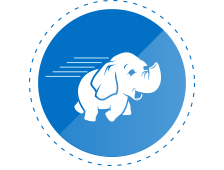 With the Syncfusion Hadoop distribution, in minutes you can create clusters using commodity machines running the most recent versions of Windows. 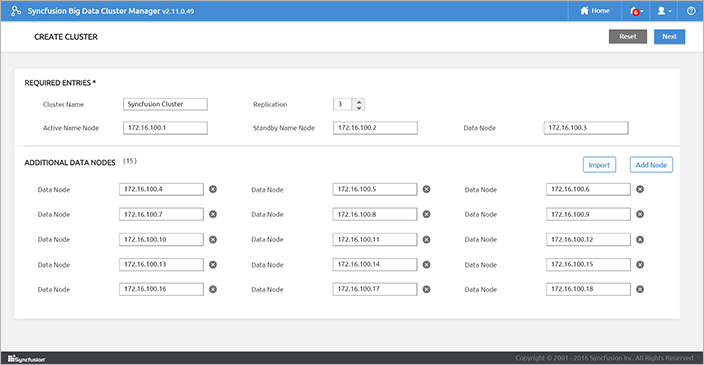 Our cluster management system comes with built-in support for managing multiple clusters. Easily manage and monitor multiple clusters. All you need is a web browser. The included monitoring system provides information on the general health of your cluster. It also provides detailed metrics on nodes that are part of the cluster and jobs running on the cluster. Cleanly integrated support for the scientific Python stack with features such as integrated Python package management. Commonly used packages are bundled with an easy to use interface to update and add packages as needed. Spark excels in processing in-memory data. It supports loading data into a cluster-wide in-memory cache to deliver the best performance in data visualization and retrieval. 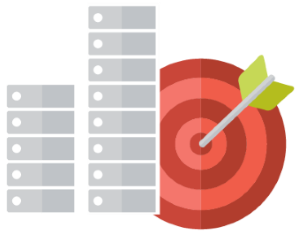 With the cluster manager, you can cache tables in a Spark thrift server with just a few clicks. 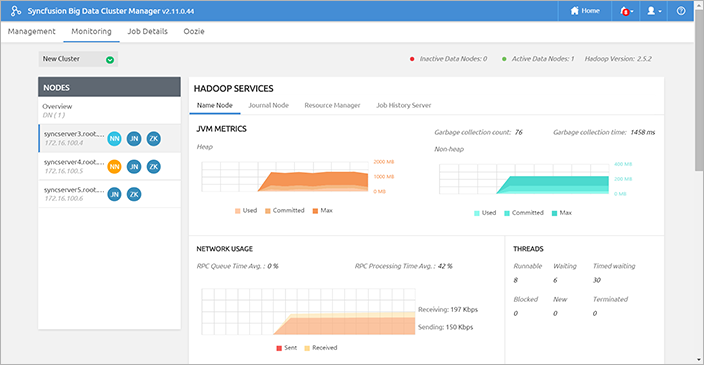 Oozie is a workflow scheduler system for managing Hadoop jobs. The Syncfusion Big Data Platform makes the job submission and monitoring easier by providing a user-friendly interface to submit jobs and a dashboard for monitoring. Sqoop helps you transfer data from relational databases into HDFS. The Syncfusion Big Data Platform makes the job even easier by providing a user-friendly interface to Sqoop. 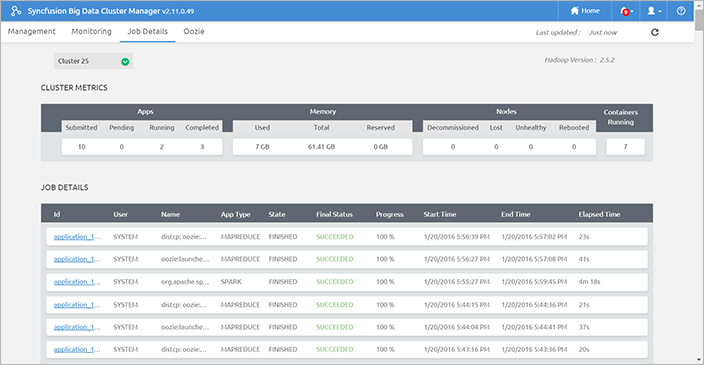 You can easily create, deploy and scale Syncfusion Hadoop cluster in Microsoft Azure virtual machines environment in minutes. The Syncfusion Big Data Cluster Manager allows you to effectively manage the resources in Microsoft Azure with the options to track billing details and to shut down, restart and destroy the virtual machines as required. You can also start and stop the virtual machines with Hadoop cluster at scheduled intervals. You can easily create a Kerberos-enabled secure Hadoop cluster in Windows within minutes. The Syncfusion Big Data Cluster Manager facilitates seamless integration with Active Directory Server. You can easily manage the access control for HDFS, Hive, and HBase to the users. The Syncfusion Big Data platform can run jobs written in any language. Java, Pig, Hive, Python, and Scala are all supported. 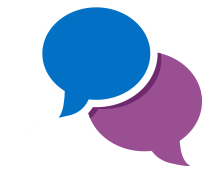 There is also complete support for C# or any other .NET platform language. The Syncfusion Big Data platform comes ready for YARN applications. You can run any YARN-compatible application system. You are not limited to MapReduce. 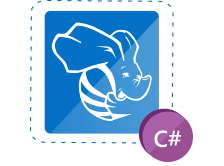 Data stored in the Hadoop Distributed File System can be directly accessed from your C# applications through Hive. We ship an extensive set of C# samples that demonstrate access under different scenarios. No ODBC driver or other extensions are needed. Everything you need is included. The commercial version of the Syncfusion Big Data Platform comes bundled with technical support. There are no limits to the number of support incidents you can create. You can interact directly with our big data team through our unique Direct-Trac support system. At Syncfusion, we have deep expertise on the Hadoop stack. With our extensive experience building the Syncfusion Big Data Platform, we can build end-to-end big data solutions for you better and faster than anyone else. Contact us today.